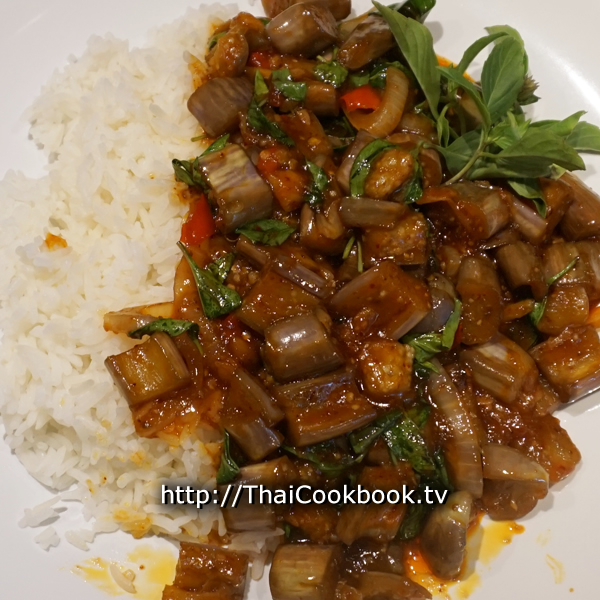 This Thailand-style stir-fried eggplant has a deep, rich, smokey, and spicy flavor that will make you forget all about the fatty meats we usually use in dishes seasoned with Nam Prik Pao. It's really just so good, and the color of these purple striped eggplant I used this time add an extra something to a plate of food that is already calling out to your hungry stomach. 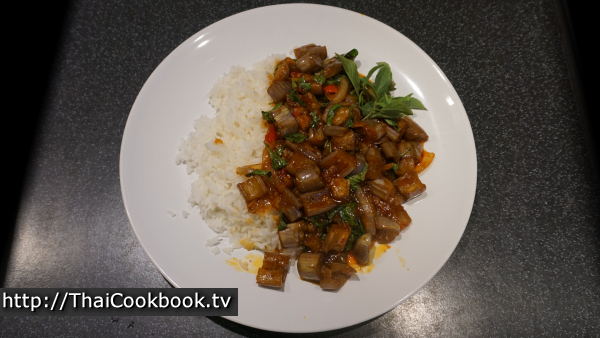 What's in our Spicy Stir-fried Eggplant. 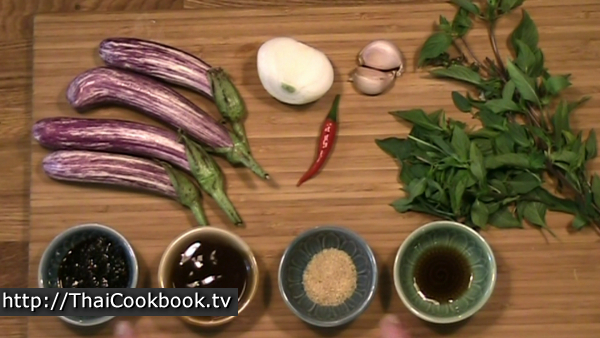 How we make our Spicy Stir-fried Eggplant. 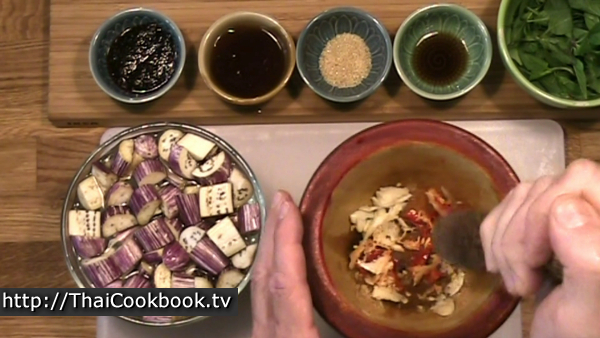 1) Fry the garlic and chili in a little oil for about 30 seconds, then add the cut eggplant and coat in the oil. 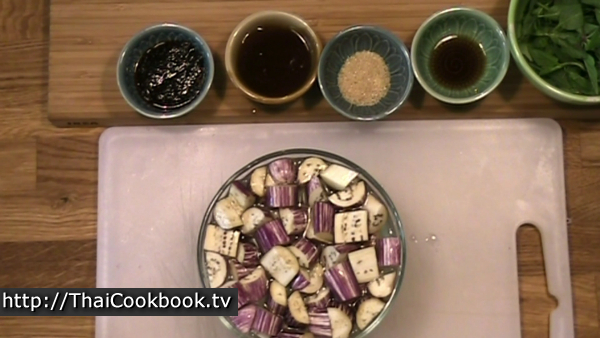 Add 1/4 cup of water and boil for about 5 minutes or until the eggplant is soft. 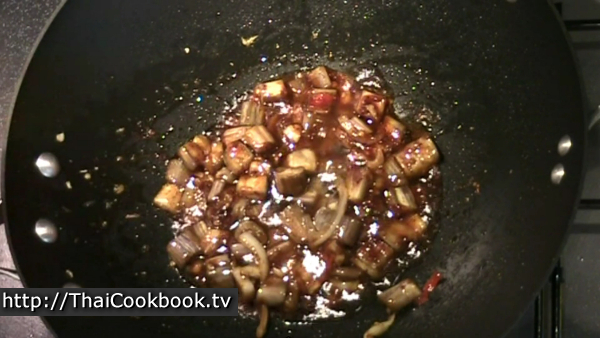 2) Add the sugar, soy sauce, oyster sauce, and onion. 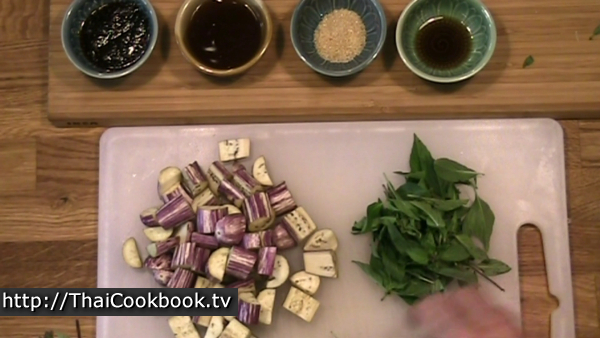 Stir together and fry until it gets sticky, then add the prik pao sauce. Stir together and continue frying until the pan gets dry. 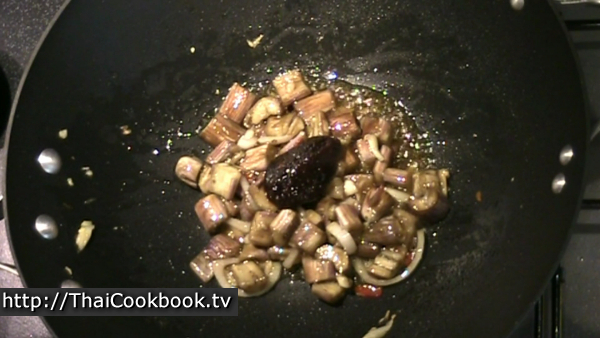 3) Add 1/4 cup of water to the eggplant and deglaze the pan until you have a rich and thick sauce. remove from the heat, toss in the basil and serve immediately. You'll need about 2 cups of bite-sized eggplant pieces, so how many you need will depend on the size of the eggplant Here I used this very small eggplants, so it took 4 to get enough. 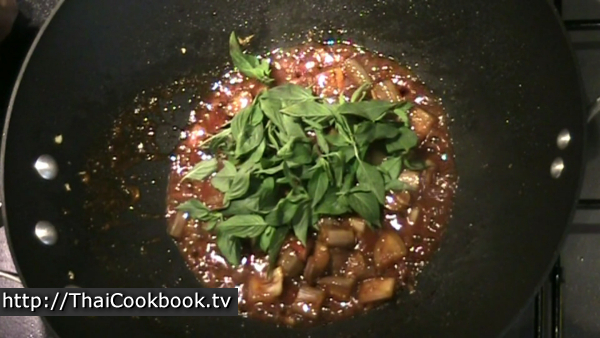 We only use Horapah basil when adding it to a spicy chili paste like Prik Pao. Horapah is sometimes called Star of Siam, or just Thai basil. It's the one that smells like licorice and has little purple flower tops. Cut the eggplant and have it ready, Also pluck the leaves and tops from the basil until you have at least one cup of leaves. Add 2 teaspoons of salt to a small bowl of water, then add the eggplant to the salty water and soak it while you get everything else ready. The salt water will keep the eggplant from turning brown. Grind the hot chili and garlic until it is well broken up. 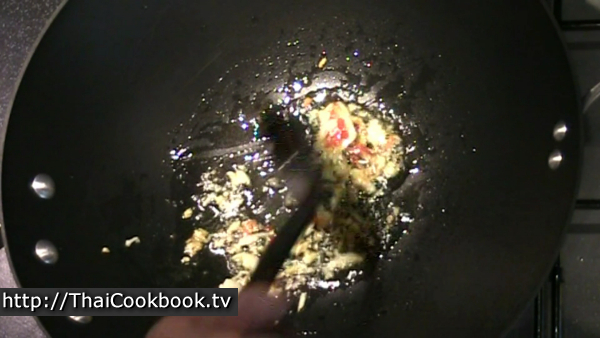 Add one tablespoon of oil to a wok or frying pan. Fry the garlic and chili for about 30 seconds over medium heat. It's better to take more time so you don't burn the garlic, but you just need to fry it until it softens a little. 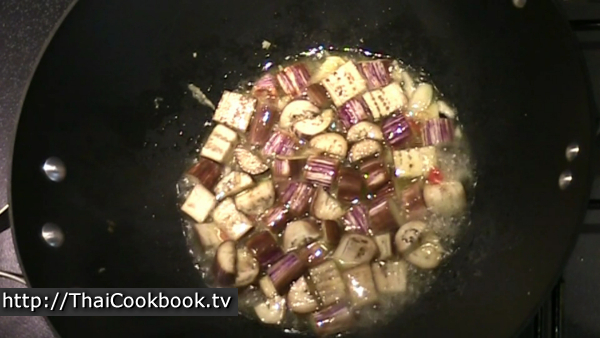 Stir the eggplant into the chili, garlic, and oil until it starts to fry and is well coated in oil. Next add 1/4 cup of water, stir it in, and let it get hot. Boil the eggplant for about 5 minutes, or until it gets soft and most of the water has evaporated. 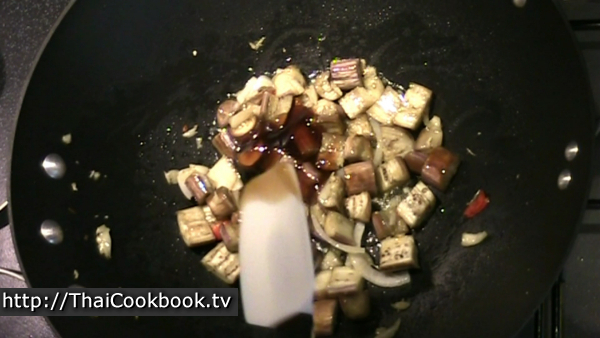 Add a few pieces of onion, the soy sauce, oyster sauce, and the sugar. Stir it all up well and let the sauces fry until it gets dry and sticky. Next add the prik pao roasted chili sauce. Stir it in and fry more, until the pan is quite dry and it looks like it might burn. Add another 1/4 cup of water before it starts burning. Stir the water into the sauce and deglaze the pan well by stir around the sides and scraping the sticky sauce into the water. Let it cook until the sauce gets smooth and thick. Turn of the heat and let the eggplant cool for a minute, then toss in the basil and fold it carefully into the eggplant. You just want it to wilt and little. Serve immediately next to some hot steamed rice as a one-dish meal, or on a small plate as a vegetable side dish to be eaten with other foods.